AFC Blackpool got back to winning ways on Saturday with a hard fought 2-1 win over Nelson at the Mechanics Ground. A brace from leading scorer Ben Duffield ensured all three points for AFC in this Lancashire derby. With a number of first team regulars out injured, manager Dave Worthington was again forced into a number of changes, with Isaac Sinclair making his debut. AFC took the lead after just five minutes when Duffield pounced on a defensive mix-up to slot the ball home. With Nelson struggling in the league, the home fans were hoping the afternoon might see a comfortable win, but it was not to be. Neither side could take control of the game, with both having opportunities to score. It was Nelson who struck next in the 30th minute as poor defending from the home side meant Kenneth Taylor was left unmarked to slot home. Defender Jack Taylor saw his powerful shot from the edge of the box rebound off the crossbar with Nelson keeper Alex Grice stranded but it stayed 1-1 at the break. Ten minutes into the second half and AFC took the lead. 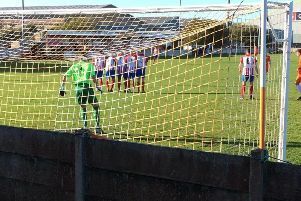 Sinclair was brought down in the box and Duffield converted the penalty as AFC held on for victory. It means they are currently ninth in the Hallmark Security League First Division North, but with games in hand on all the clubs above. Next up for them is a home tie against Stockport Town on Saturday in the second round of this season’s First Division Cup. AFC Blackpool: Cameron, Taylor, Hall, Mottram, A Pickering, D Pickering, Dickson, Baird, Duffield, Finlayson, Sinclair. Subs: Donaghy, Bradley, Bishop.